Flaming Katies, or Kalanchoes as they are more often called, are easy to grow, winter blooming plants with waxy, green, scalloped edged leaves, and clusters of tiny, brightly colored flowers that continue for 6 weeks or longer. The true species Kalanchoe blossfeldiana grows up to 20" tall and has crimson red flowers but most Kalanchoes that are commonly available today are dwarf hybrids that only reach 8"-12" tall, with flowers in shades of red, pink, yellow and orange. Christmas Kalanchoes generally become available at nurseries early in the fall. Kalanchoes are only hardy in USDA zones 10-12, elsewhere they are grown as house plants or in a greenhouse. 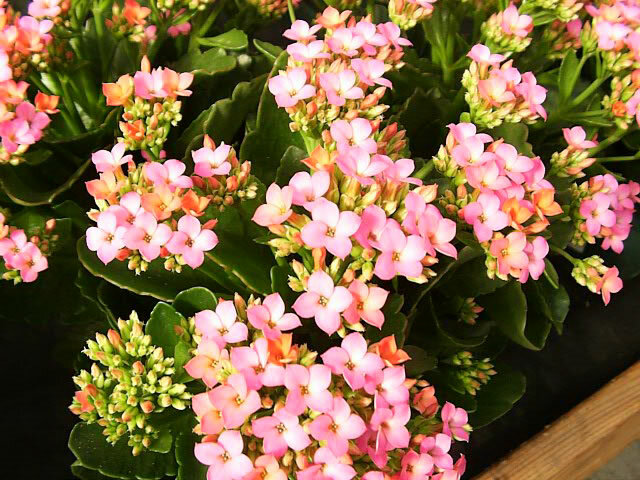 Kalanchoes are well adapted to growing indoors, preferring daytime temperatures of 70°-75° and nights at 60°-65°. They should be grown in a good quality potting soil and kept where they will receive bright, indirect light or sun. Kalanchoes are succulent plants that are capable of storing a considerable amount of moisture in their leaves, so they should only be watered when the soil is dry to the touch. Never over-water! Kalanchoes dislike humid environments and tend to develop mildew if the air too moist for their liking. Feed them monthly while actively growing, using a flowering house plant type fertilizer. Remove spent flowers regularly, and your Kalanchoe will probably re-bloom again in 6-8 weeks. In the garden, your Flaming Katy will need protection from hot afternoon sun. kept in complete darkness for a specific amount of time each day. Once the day length decreases to approximately twelve hours, the plant recognizes that it is time to bloom. To get your Flaming Katy to bloom in time for Thanksgiving, keep it in a box or dark closet for 12-14 hours a day, beginning in early September. 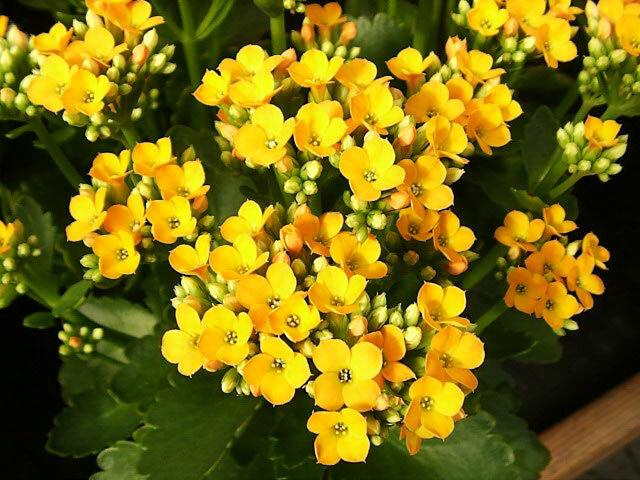 For blooms at Christmas, keep your Kalanchoe in the dark beginning before October 15th. Although they are considered to be perennial plants, Kalanchoes tend to decline after their first year or two. Luckily, they are very easy to propagate and keep fresh, new plants growing. Christmas Kalanchoes may form small plantlets along the margins of their leaves that can be easily removed and given their own pots. Leaf cuttings and stem cuttings can be taken in late spring. Kalanchoe seeds require light for germination, so DO NOT COVER them! Start seeds indoors in by June 1st for blooming size plants at Thanksgiving, July 1st for Christmas blooms. Maintain a temperature in the growing medium of 70°-75° during germination, which only takes 10 days. Pinch young plants back lightly at 6-8 weeks.